This amplifier provides 8 ports for multiple TV sets, cable boxes, or cable modems. It boosts signal strength by more than double (+4dB), Improves Analog, Digital & HDTV Picture Quality, and Improves UHF/VHF/FM Antenna Reception! PCT amplifiers are designed to fit into smaller spaces, while providing the FULL performance of larger sized amplifiers. Amplifiers should be installed at the point of entry, or as close to the cable company connection as possible. 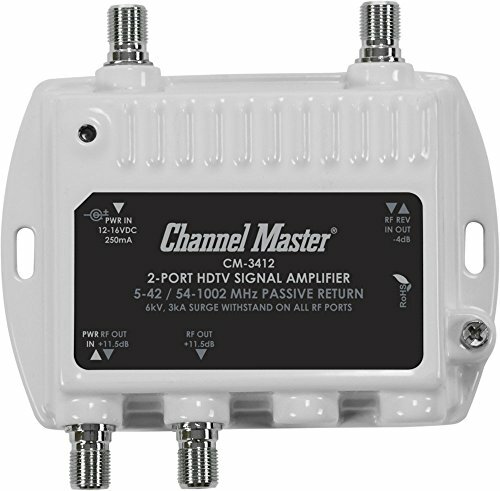 Passive return means that it is compatible with all cable services, but the signals sent back TO the cable company are not amplified. Compatible with OTA HD television. 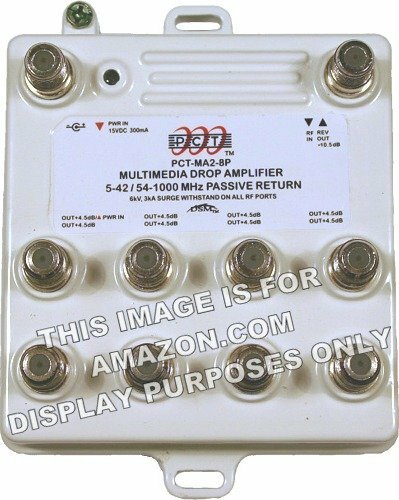 This is a brand new, four (4) port cable television drop amplifier, just like the ones that your local cable company uses to correct their system's shortcomings. This new model packs a powerful punch in a compact, easy-to-install package! By connecting these fantastic signal boosters to the drop cable coming in from the street, you can increase the signal strength entering your home by up a whopping +7 db per port! If you have multiple televisions or run a cable modem for your internet, this product is recommended. By having four ports come directly off of the amplifier, there is no need for additional splitters, which reduce signal strength. If you are tired of tv pictures that don't seem as clear as they should be, dropped internet connections, or just desire a reliable amplifier to give continuous, steady signal to your home or business, this is for you! 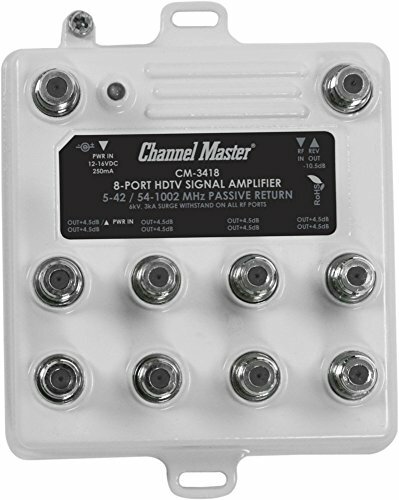 This amplifier provides 8 ports for multiple TV sets, cable boxes, or cable modems. It boosts signal strength by more than double (+4dB), Improves Analog, Digital & HDTV Picture Quality, and Improves UHF/VHF/FM Antenna Reception! The Unit can be used with Cable TV, OTA Antennas (Analog or Digital) and Satellite Services. *** PLEASE NOTE: When using with Satellite Services, the Amplifier can NOT be directly connected to the Dish ... however, it CAN be used on the Output Side of the Receiver for distribution to multiple TVs. PCT amplifiers are designed to fit into smaller spaces, while providing the FULL performance of larger sized amplifiers. 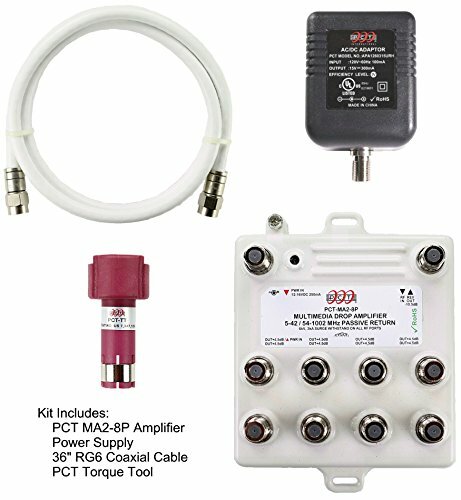 Includes PCT 36" White RG6 Coaxial Cable For Connection To Power Supply, as well as PCT installation tool (PCT-TT) which makes it easy to tighten and loosen coaxial connections to the amplifier. Warranty replacement provided by seller, not by PCT directly. Spectrum Antenna distribution amps will split your antenna signal so that it can be used on up to 4 TVs in your home. This will boost your digital TV and HDTV signals increasing their overall signal strength for up to 4 TVs in your home. Our distribution amplifiers are commercial grade and meet stringent US and international standards, including SCTE. The Antenna Pros amplifier can be used in HDTV, CATV, off-air, analog and digital RF distribution applications where performance and reliability are required. 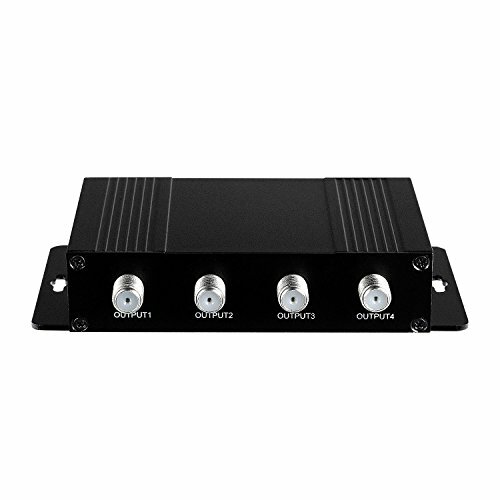 The SP-X4 is a high quality four port output digital TV distribution amplifier. 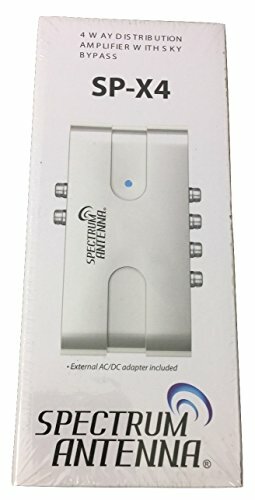 ViewTV 4 Port Amplifier / Splitter - Improves Signal for TV Antenna, Cable TV, HDTV and Helps With Dropped Internet Connection for Internet Modems. 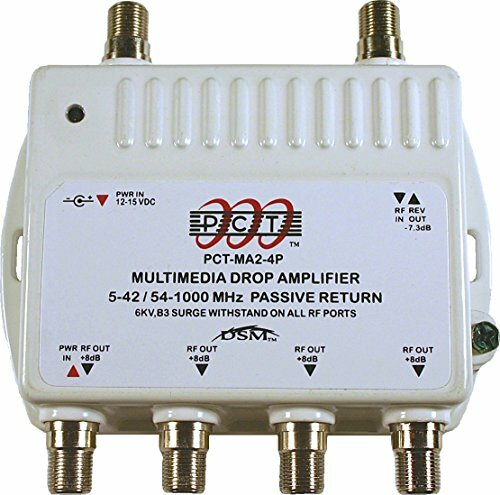 This amplifier provides 4 ports for multiple TV sets, cable boxes, or cable modems. It boosts signal strength by more than double (+7dB), Improves Analog, Digital & HDTV Picture Quality, and Improves UHF/VHF/FM Antenna Reception! It is compact and easy to install. Connect to the drop (main line) and eliminate the need for additional splitters, which reduce signal strength. It ships with everything you need to complete the installation, including comprehensive installation notes. The Unit can be used with Cable TV, OTA Antennas (Analog or Digital) and Satellite Services. *** PLEASE NOTE: When using with Satellite Services, the Amplifier can NOT be directly connected to the Dish ... however, it CAN be used on the Output Side of the Receiver. This amplifier provides the exact same OR BETTER specs as the ones that other sellers are selling for much higher prices. PCT amplifiers are designed to fit into smaller spaces, while providing the FULL performance of larger sized amplifiers. 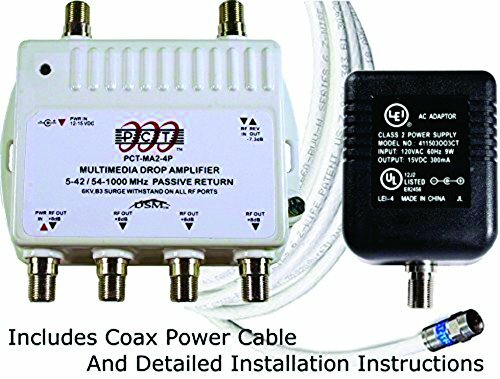 Includes Coaxial Cable For Connection To Power Supply and detailed Installation Instructions. 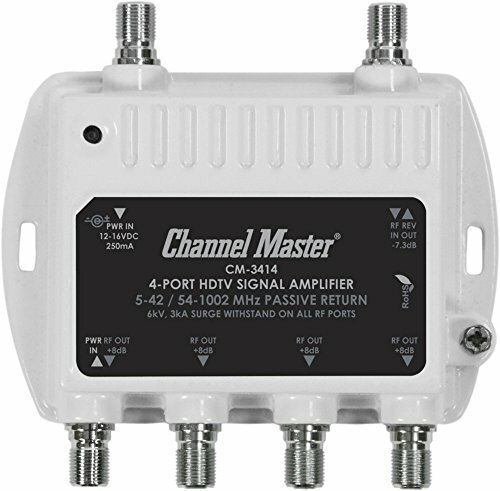 Channel Master | What's A Distribution Amplifier & Do I Need One to Improve TV Antenna Reception? 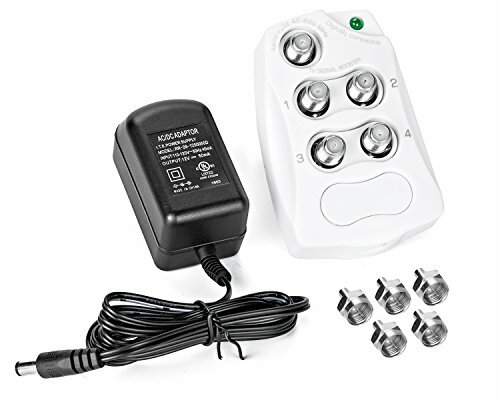 Compare prices on Antenna Amplifier Splitter at ShoppinGent.com – use promo codes and coupons for best offers and deals. Start smart buying with ShoppinGent.com right now and choose your golden price on every purchase.